If you are looking for something a little different and more exotic for your next vacation, why not consider Thailand. If you are looking for something a little different and more exotic for your next vacation, why not consider Thailand. If the country’s pristine beaches and relaxing atmosphere don’t win you over than the bang-for-buck, the great food and people sure will. Thailand offers it’s visitors some of the most beautiful places with endless sites and attractions suited for a variety of travellers. Here are 7 great reasons to make Thailand your next vacation destination. There are great package deals to Thailand and once there tours, food and clothing are all very affordable. When you want some down time, go and enjoy spa treatments for far less than you would pay at home. Thailand wasn’t given the nickname “Land Of Smiles” for no reason. The natives are kind, happy and willing to help you if you are lost. Thai people welcome tourism, but don’t have a reputation for being pushy to tourists. We already said it was cheap, but did you know it is also delicious? There are a variety of options and when in doubt ask a local what they recommend what you should you try in that region. Please note that often their idea of spicy is what we typical would call extremely hot. There are many great beaches and islands in Thailand, and plenty of them are worth visiting. But don’t overlook the popular Island of Phuket, it earned its great reputation for a reason. The multi-colored sunsets should not be missed and Khao Phra Thaew National Park, a rainforest with protected wildlife, is a treasure to experience which offers great hiking trails and waterfalls. This cosmopolitan city offers its visitors culture with its floating markets, history at the Grand Palace and Temple of the Dawn (just to name two sites), excitement at rooftop bars and mouth-watering dining experiences with its local cuisine. Haad Rin on the island of Ko Pha Mgen is where the full moon party phenomenon first started, and today you can experience them throughout Thailand. These famous beach parties are known for great music, intense dancing and glow in the dark body paint. Yes, it may take a while to get there, but once in Thailand it is quick to hop a flight to neighboring countries and Islands. Bali is only 4 hours away, Hong Kong is only 3 hours away and Singapore is only 2 hours away. This makes Thailand a great destination to start or end an Asian Adventure. 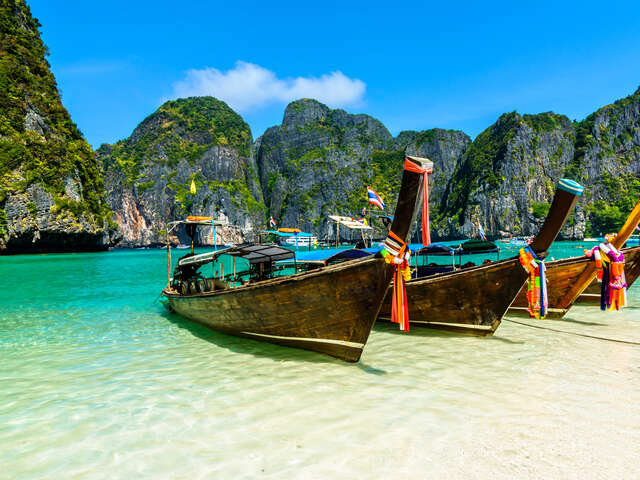 Want to learn more about Thailand, give one of our UNIGLOBE Travel Specialists a call today.